The vision presented by Andrew Maynard Architects is that the Portable Park can be established in a vacant space for a temporary period to enhance access to open space, while also retaining currency and expectation of the site itself. 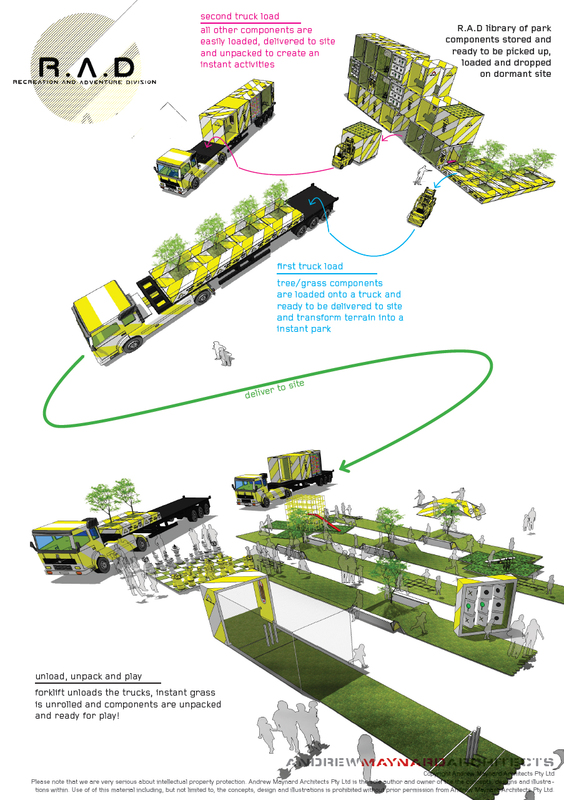 The Portable Park is described as enabling social, recreational or cultural engagement within the built environment. The parks are comprised of a series of fold-out modules such as picnic tables, seating and playground equipment which are arranged on instant grass strips. Like other third spaces, this Portable Park is designed to encourage sociability and a sense of community. Image too the passing ice cream vendor or a pop up coffee wagon. While the portable or pop-up cannot replace designing open space into the city, the Portable Park can become a useful platform for negotiating anxieties about higher density living while also considering other approaches to enhancing amenity in the built environment. Importantly, in bringing people together the park can act as a platform for more spontaneous and hopeful forms of place-based grassroots organisation and networking. 1. The Committee for Melbourne looks strategically at issues that impact beyond short term electoral cycles. The Committee brings together Melbourne’s most influential businesses and organisations to work collaboratively to enhance Melbourne – economically, socially and environmentally.